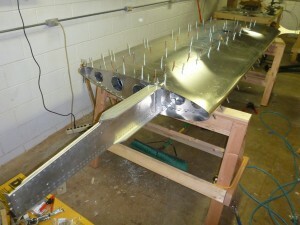 Attached top and bottom skins to the wing. I did this with the wing stood vertically on the saw horses (supported by the main spar). I checked to make sure there was no twist and that the wing was square multiple times while drilling and clecoing. 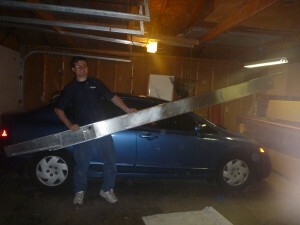 Eliminating twist seemed to be trickiest. 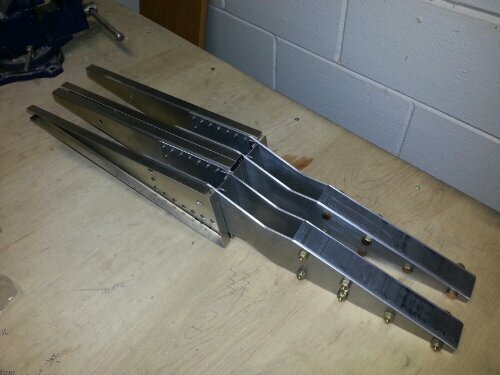 My saw horses weren’t perfectly aligned with each other so I needed to add shims under the spar to remove twist caused by the saw horses. 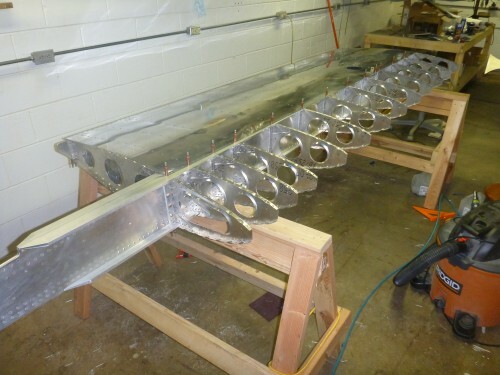 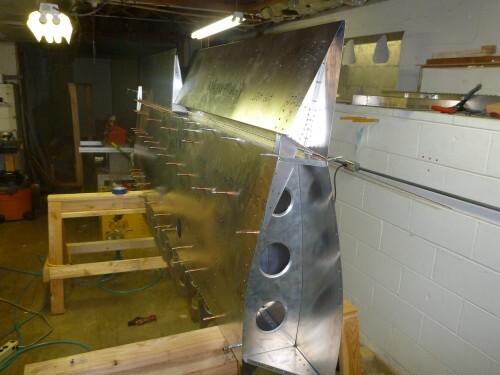 Eventually, I was able to make multiple measurements with a level on the rear spar and convince myself there was no measurable twist down the length of the wing. The “squareness” of the wing got locked in pretty quickly by the clecoes. 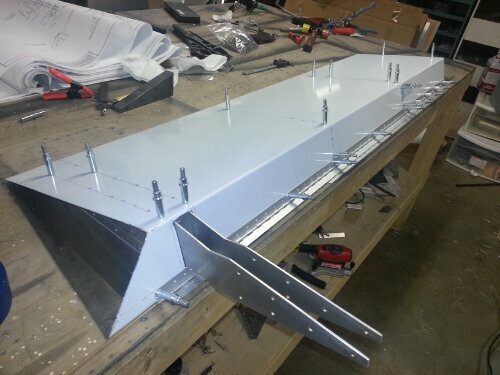 The twist didn’t get locked in until I finally clecoed the skin to the main spar, but I’m extremely happy with how it turned out and don’t anticipate any problems with the next wing. 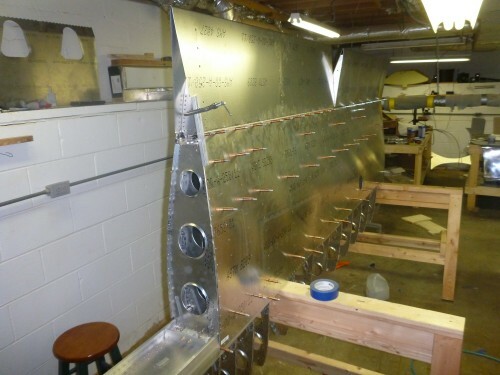 Looking down the lightening holes to convince myself the wing is square. Clecoed the top side of the forward skin to the ribs and used a ratchet strap to pull the leading edge around the bottom side until I could cleco it to the spar. 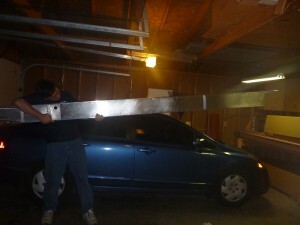 This wasn’t nearly as difficult as I expected it to be. It’s been a while since I posted due to being too lazy to figure out why my phone was having a hard time posting to the blog. 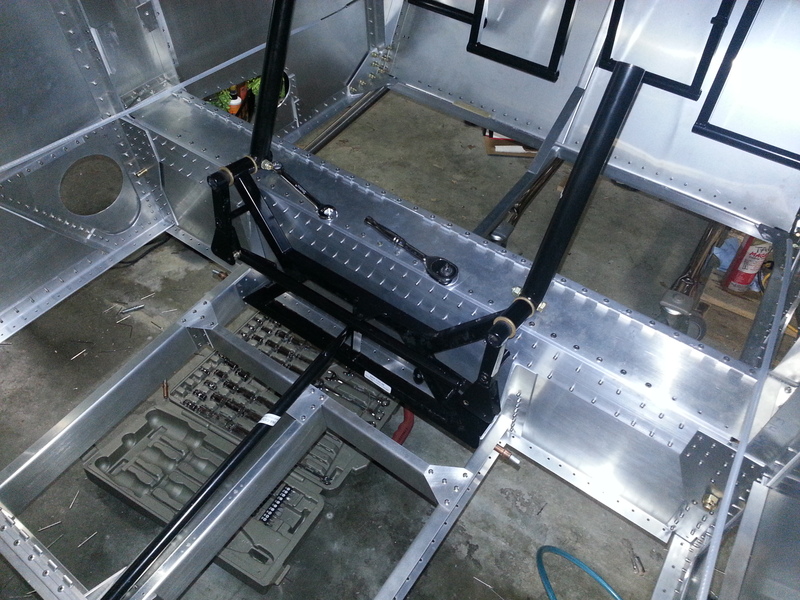 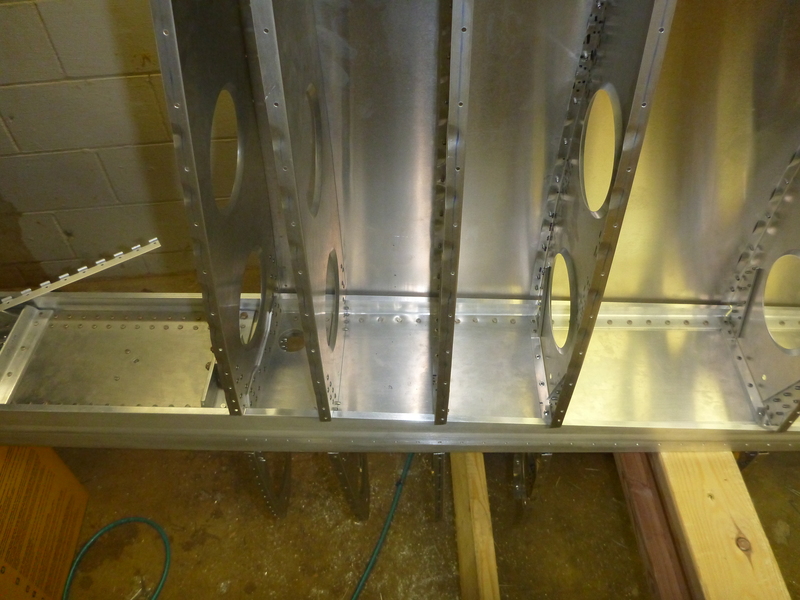 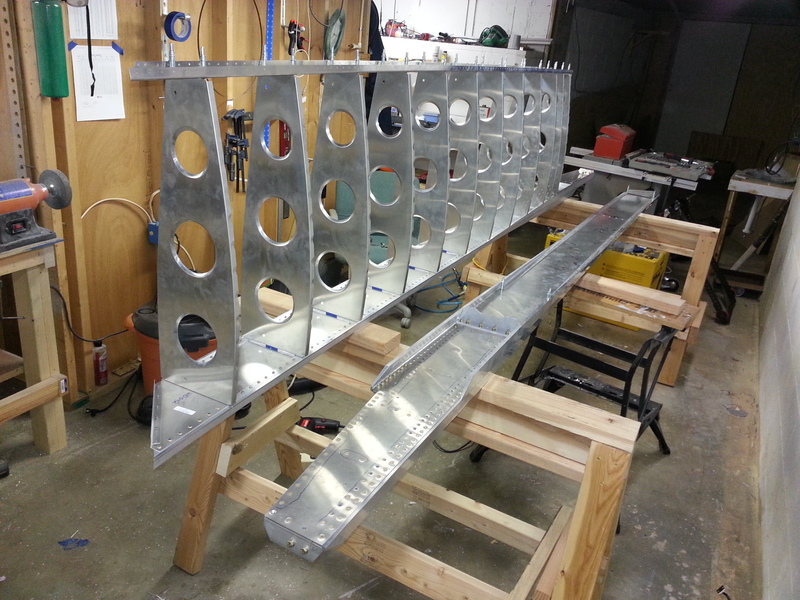 I made most of the modifications to the ribs and riveted the stiffeners on. 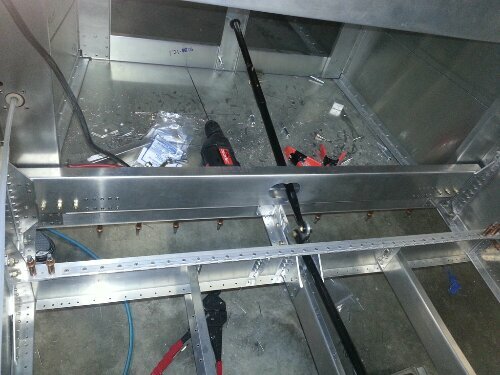 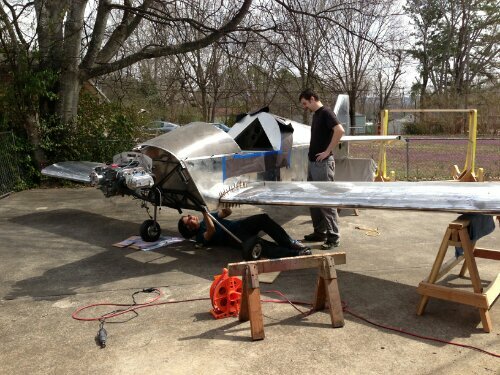 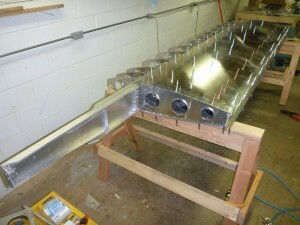 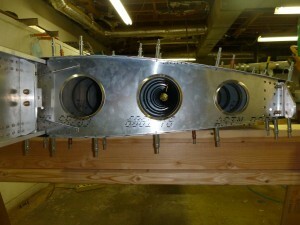 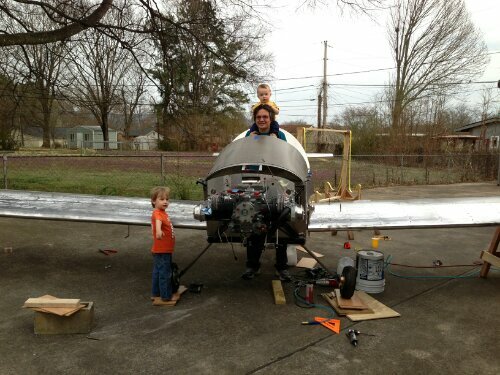 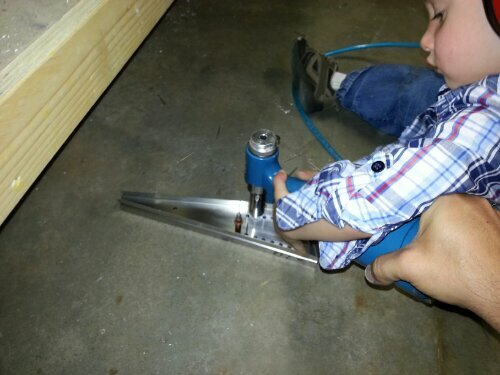 Nathan helped with the aileron drive ribs. 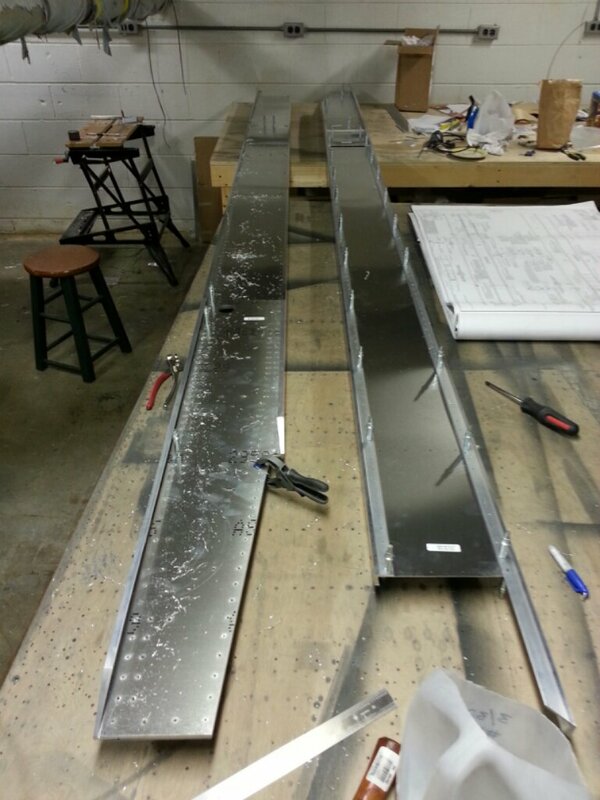 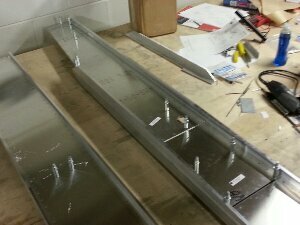 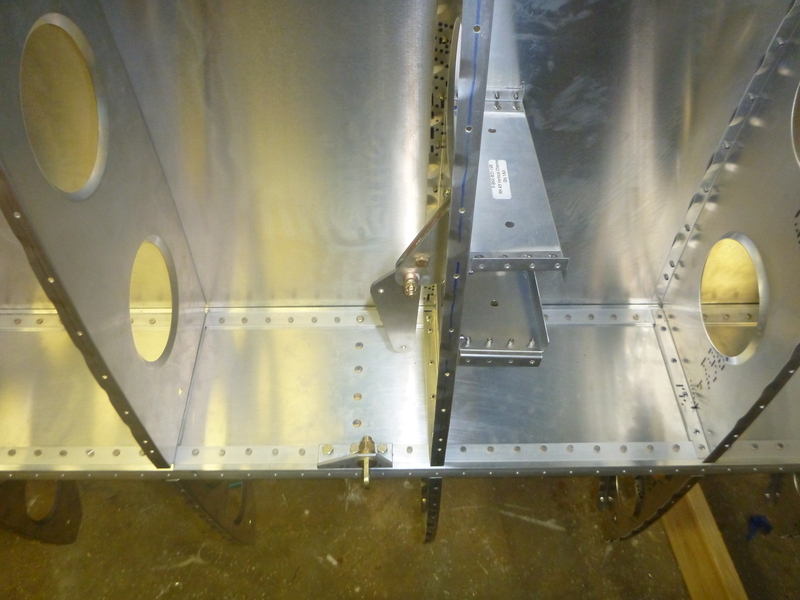 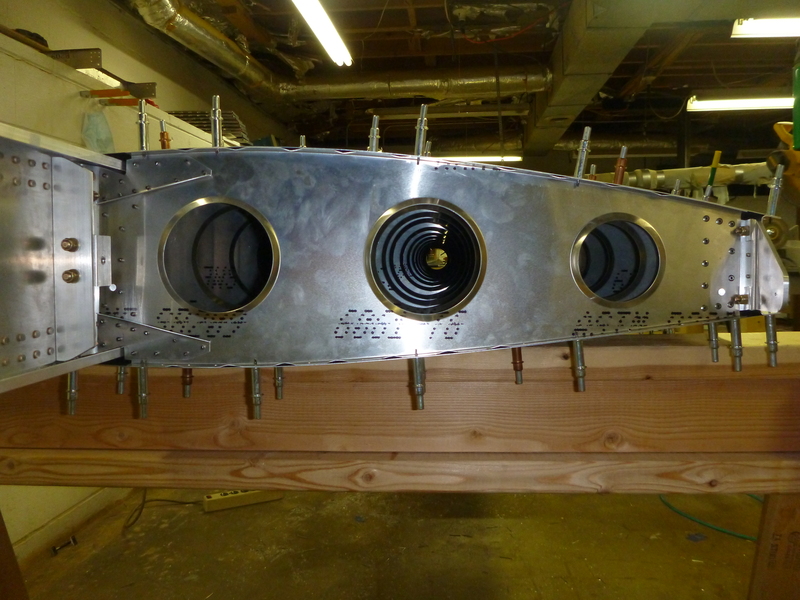 I have mostly finished two ailerons and now have two flaps in the state of the aileron pictured below. 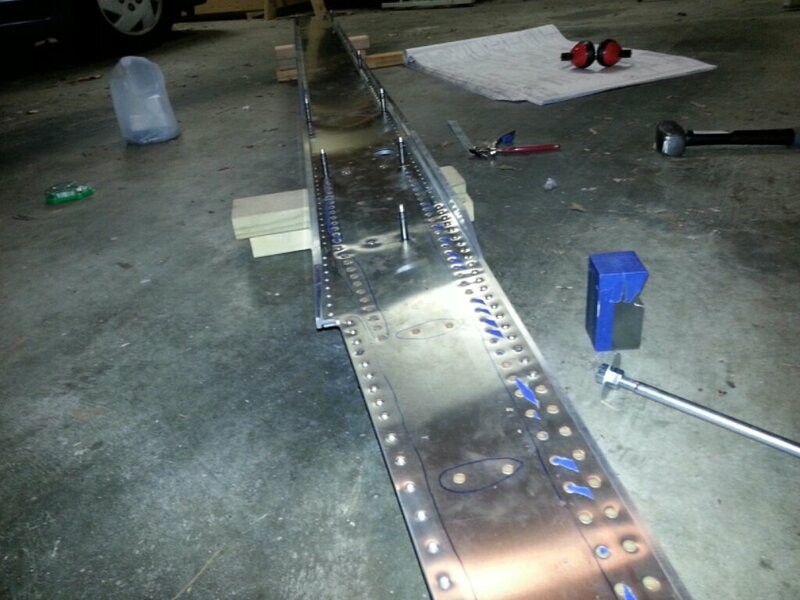 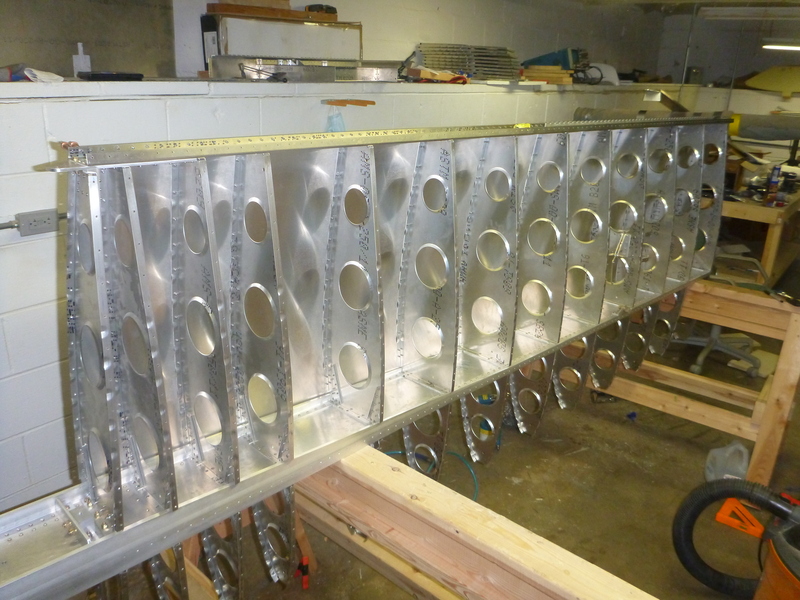 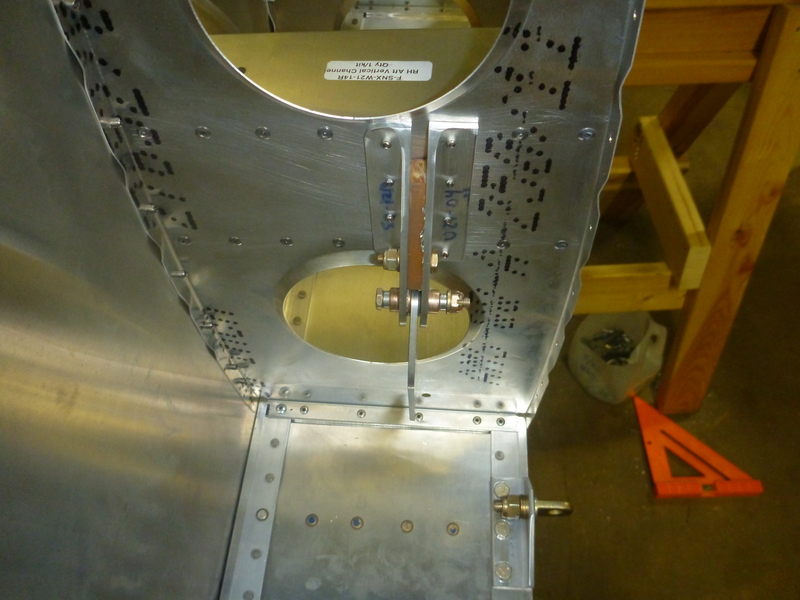 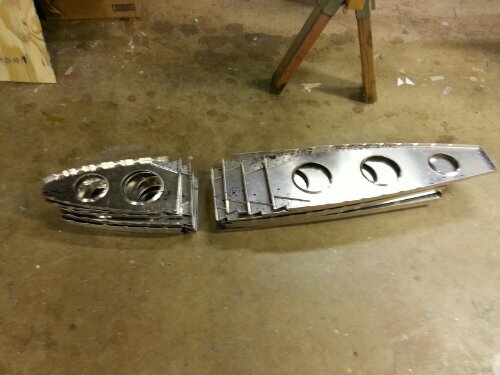 Finally finished a ridiculous amount of solid riveting and have a mostly-rived left spar to make airplane sounds with.